The location is behind my house showing the makeshift rain gutter over the outside stairs to the basement. The "Take It!" came from the holes on the left side of this reliable fabrication I put up to prevent my basement from flooding. It appears that a small dog walked on the plastic and was just heavy enough to puncture the plastic and yet light enough for it to make its way out without getting stuck. What this means for me - is the new attention to making certain all the gates into the back yard are constantly closed to help keep out unwelcome critters, if at all possible. 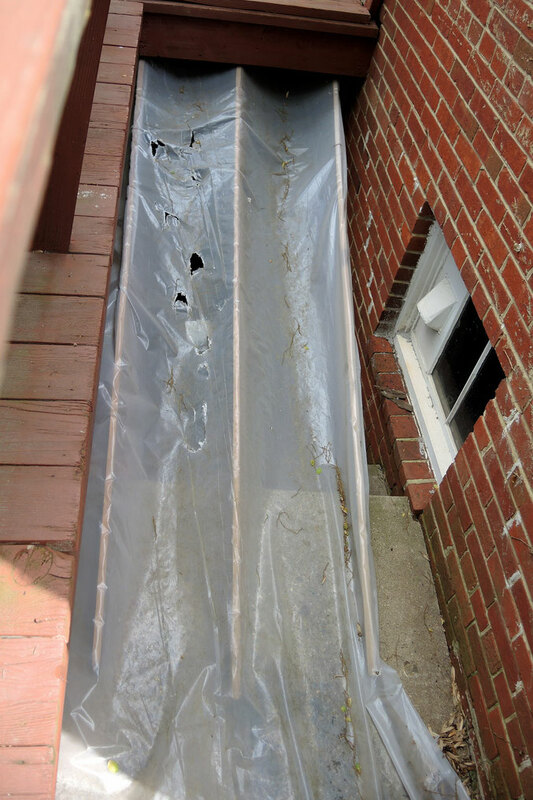 The idea for the plastic sheeting stapled to some small wood strips to form a shoot for water to drain off into the yard rather than down the stairs arrived after years of having rain cascade down the stairs and overwhelm the small drain at the foot of the stairs. Just as soon as the water reached the right level - it flowed into the basement which was always a pain to mop up. The strips of wood are on pegs fastened into the underside of the landing at the upstairs back door. These strips and the plastic covering them - are easily pushed aside if one has to make an hasty exit from the basement. They can also be moved aside when moving items in or out of the basement. Now when there is a heavy rain - I do not have to worry about flooding any more. I will put a new section of plastic sheeting on the strips and toss the old one with the foot holes - as it is an easy fix. Perhaps this might work for someone that views this solution to my problem. Just be certain to include the closing of the gates - lol. Luckily the animal didn't get stuck. That would have smelld bad after a few days. Quick thinking on your part to build something like that. How clever. Does it seem to work well? Poor critter, must have been a nightmare to climb out of, I can only imagine how awkward that must have been for it to climb out of. Yes - I am very glad the " critter " made its way out of this odd plastic trap and left only the holes as a reminder of its visit. I actually changed out the plastic earlier this week and it is now, once again working like a charm. I made some improvements to the way it works and am even happier with it than I was before. Regards to all.